From what I understand, you're not supposed to combine more than one Major Life Change in a single year, as it stresses the body (and presumably the mind), and can impact your immune system. So, the more Major Life Change in a small amount of time, the greater one's chances of getting ill.
And yes, we knew this before we started stringing Major Life Changes together like so many popcorn garlands on a Christmas tree. And of course, we decided to select the biggest Major Life Changes in the book, right behind Death of Family Member. Yes, Getting Married and Buying a Home are #2 and #3, and we're doing them simultaneously. Which means we're incredibly cocksure, or we've been secretly lobotomized. The re-wire on the house is complete. I did the final walkthrough with the electrician today and gave him our punch list of little finishes I wanted to have, and he arranged to have a drywall guy come out and patch any access holes totally free of charge (which they normally don't handle, and aren't obligated to handle). So needless to say, I'm very pleased with the quality and customer service of Eagle Electric/Mister Sparky (serving the greater Seattle area). In the midst of all of the wedding and home improvement hubub (which is not quite a fracas and way short of a hullaballoo), it's good to get some good news: the windows are getting installed two days early. That's like a 50-gallon barrel full of win. And Randy flies in today for a pre-wedding home improvement hootenanny (my GOD, I'm folksy today!). We saw Randy last summer on the Cali trip, and it will be good to get a week and a half to hang with my big bro. TFMD had her bachelorette party last Saturday, which was (according to the girl herself) extremely fun and chock full of closure. She was kept safe by her good friends, and for that I'm extremely grateful. We're now down to 10 days until the wedding. We continue to unpack and organize, to put up some last-minute Halloween decor, and to prepare for that next checkpoint. Or is it? 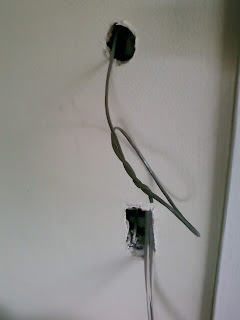 The rewiring of the new house began Monday morning, and will continue (likely) all week. 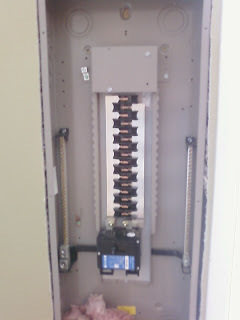 This is, for all intents and purposes, giving our 87-year-old house a brand new brain and nervous system in the form of all new wiring and a new 200-amp service. As crazy as it looks from the pics, it's really less invasive than I would have thought, thanks mostly to the technique of fishing Romex cable through the attic and crawlspaces up and down wall studs - as opposed to opening up the original plaster-lath walls and having to patch them up later. They're going to run my surround sound wire as well, so my 7.1 audio will be up off the floor and not have surface wiring running everywhere. The downstairs bathtub surround was installed the first week we were here, but because it bolts to the studs, they had to cut some drywall out and then tape and mud, prime and paint. It looks like now that portion is done. Tyler got a wall and door (whose frame is ridiculously out of square due to everything being built around an original mammoth weight-bearing floor beam), and the painter is finishing up the touch-ups today. Then the carpenter will rough in a counter top where the cabinets will go when they come in. And the new windows should come in at the end of next week. All of this keeps us focused on the day-to-day, and doesn't allow us to obsess over wedding details, which I consider a real blessing in disguise. I've been really distracted with the move and the moving in, which are two distinct things. Apologies for being tardy with some updates. Hopefully I will get back to a normal output when we're done with the whole wedding thing and get back from Hawaii. I guess that means it must be fall. Storms blowing in, red-orange leaves leaping to their deaths along the sidewalks, football... oh, and meeting the folks who bought the home you lived in for a decade and a half. I say this, not because they read the blog, but because it's true: we met the ladies of the house and they're super nice people. I couldn't be happier with the folks who bought the place, and I wish them many happy years there. Yet, as much as it gave me the warm fuzzies to meet the new owners, it was odd visiting the old place as just that - a visitor. It had been a day that began in conflict with the boy-child, continued in household organization and shopping, and ended with a trip to the smaller of the two storage units. By the time we got home, I was all kinds of done. Fortunately, I had a massage appointment, so that gave me a boost and realignment, and I was able to make dinner while TFMD succeeded in uncovering our dining table. So we were actually able to eat dinner at the dining table for the first time in our new home - what a concept! Cuddled up and watched Father of the Bride (the Steve Martin remake), then crashed. Things with the boy aren't much better, and that saps a lot of our energy, but we're doing the best we can and have plenty going on to distract us. The living space is pretty much livable, although there will be some storing of boxes in the attic and basement crawlspaces once the electricians are done with the rewire. Speaking of, I can't wait to have an exterior outlet so we can put up the lights and Halloween decor. This street really gets into it - several of our neighbors have graveyards on their front lawns and one has an infestation of giant spiders. It's all kinds of awesome. I know that statistically, TFMD and I are still on the young side of midlife, but we like to joke about being old and crotchety. Turns out, a move that would have taken twenty hours had we attempted it the old fashioned way (and resulted in none of our friends ever speaking to us again) was done in less than nine hours and spared us both our bodies and our friendships. It wasn't cheap, but it was well worth the expense, especially since we now get to unpack boxes and rearrange furniture until the cows come home (something that would've been impossible had we done the major moving ourselves). We unpacked just enough to find some clothes and toiletries before rushing off to Bellingham for the weekend. The first public performance of Buzzkill Bride was, appropriately enough, at a wedding. Without electricity. Fortunately my gigging weapon of choice is a nice loud Ovation, and the woman has a fine set of pipes. So we were set. And because the DJ could not play the processional music, I just strummed a few bars of the song we sang later in the ceremony. It was apparently well received, and we got lots of nice comments. Not a bad debut. Followed by a vegetarian buffet by lantern light, and, once the power came back on around 9PM, some drunken booty-shakin'. The weekend seemed to be crammed full of small annoyances that, when lumped together, made for a kinda cranky time. But I think it was a good reminder that we have each other and not to sweat the small stuff. We got back home to await the arrival of our realtor with the new house keys. In talking with the neighbor just to the south of us, we discovered that the two neighbors across the street are both fellow Twelfth Nighters. Small town, West Seattle. And thus begins life in the new place. My stepmom came over last night and helped organize the pantry, while Rae and I walked down to the new QFC at the Alaska Junction to get dinner stuff. Made a nice meal of soups (butternut squash, chicken noodle), salad and rosemary bread. If I'm not home unpacking, I'm running to the hardware store or Target for storage options. 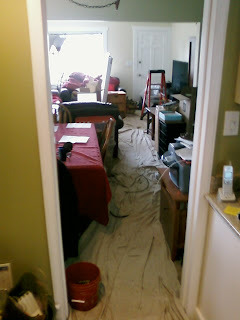 Today someone is supposed to come check out the leaky washer downstairs (we need clean clothes! ), and tomorrow the cable guy comes to hook us back up while the contractors start framing a wall and door for Tyler's room and running a new water line so we can move the fridge. We just need to have the rewiring done before the wedding. Heh.